Learn about the types of split tests available in the Listrak application. Open Rate: Out of everyone that received the email, what percentage opened it? Read Rate: Out of everyone that received the email, what percentage read it? Click Rate: Out of everyone that received the email, what percentage clicked on a link in the email? Click to Open Rate: Out of everyone that opened the message, what percentage clicked on a link? Conversion Rate: Out of everyone that received the email, what percentage made a purchase? NOTE: This option is only available if Listrak Conversion Analytics (Conversion Analytics if white labeled) is turned on for the list. Dollar per Thousand Messages: For every 1,000 messages, how much revenue was generated? The winner takes all split test will send your message to a portion of your test group. 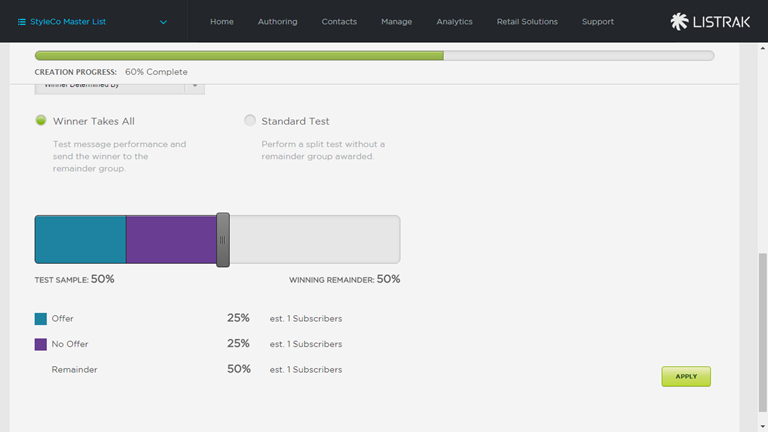 After the time frame for testing is over, the remainder of the test subscribers will receive the winning message. NOTE: The Winner Takes All option is not available if you are conducting a Delivery Date or Delivery Time split test. The standard split test will simply send the entire split test and not take into account a remainder group to send the winning message to. 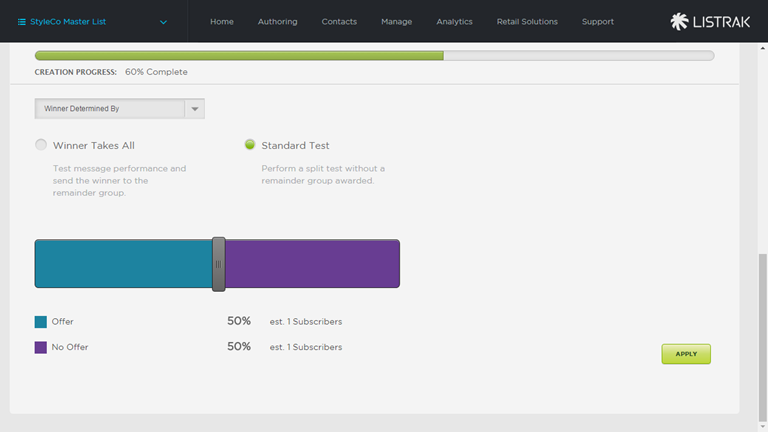 With either of these split tests, you can adjust the amount of customers that get a particular message by adjusting the slider bar back and forth. Below is an example of adjusting the slider for a four-way standard split test. NOTE: The winner takes all option maintains the same ratio across every split group. You can, however, adjust the percentage of the group that makes up the remainder. After you have selected what type of test to send, the winning criteria, and the percentage of subscribers to send to, click Apply.